By Jane on December 8, 2017 at 5:00 am and filed under Book Talk, Promo & Contests, Publicity, Writing Life, Miscellanea. This weekend I plan on getting some holiday baking done: graham cracker pound cake for the neighbors and lots of cookies! It’s supposed to snow tonight (in middle Georgia – rare)so that makes it perfect for staying home. The snow won’t stick though and will be melted away by the end of the day. Perhaps I’ll try your scone recipe – looks tasty! Congratulations on the new book! My plans for the weekend is to finish decorating my apartment and put up my tree. I have to work a basketball game tonight and a swim meet tomorrow, but I’d like to get some Christmas wrapping done and download some Christmas books onto my ipad, including Miracle on Chance Avenue! Happy release day! I know you struggled with this book, but I found it FANTASTIC. Enjoy your celebration day and pancake breakfast. I really wish I knew someone who did the ugly Christmas sweater parties but I have been seeing some really cute ones lately. One at Kohl’s had a huge cat face and it would have been perfect for me. No real plans for the weekend for us. My husband is supposed to be off work tomorrow (unless he gets called in) and it will probably be a long time from now that he gets another free weekend. So we will try to enjoy the time together. They had a second guy put in notice at his job and his boss doesn’t seem to be in a rush to hire anyone else. This will leave him as the only mechanic at the shop. He was supposed to be off Christmas weekend too, but he was told he has to work now. He was really looking forward to that 3 day weekend too. I hope you and your family have a wonderful Christmas. 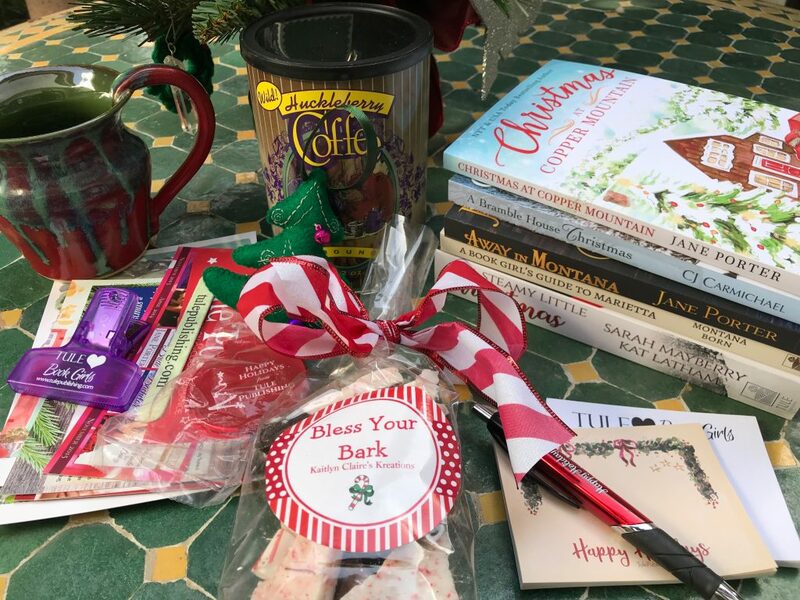 My plan is to finish Miracle on Chance Avenue (started last night when my pre-order came through), take my boys to take photos with Santa, bake treats, sort through gifts I need to wrap (so many Amazon boxes!) and catch up on some very overdue snuggle time with my husband! My son is volunteering with his school at Habitat for Humanity on Saturday, if the ‘snow’ they are calling for isn’t bad, so we are hauling him around. My husband is still trying to find time to Christmas shop for me and the rest of us will try to get the tree up because somehow Christmas is practically 2 weeks away. Happy Hildays and congrats on the new book! Happy release day, Jane. I will be resting up and working on Christmas cards. Your recipe looks delectable. This weekend will be busy with preparations for the holiday.Cooking, baking and hosting. Happy Release day! Can’t wait to try the scones! I am hoping to get my tree up, figure out Christmas cards, and find a few presents… around a party tonight that my GS Troop is putting in for other Troops, taking them to an event tomorrow morning… and a small dance performance on Sunday… wish me luck! Congratulations on the new release. This weekend I have to bake for the kids’ youth group bake sale. If I can I will also make this yummy looking scone recipe. Besides the baking for the bake sale I want to start doing some baking for my family. I also have a ton of wrapping too as well as a package to finish packing and mail out. We have some church activities and shopping to do on Sunday. Then a Boy Scouts Christmas party to get ready for on Monday. Thanks for a new recipe! Love your books! Congrats on the new book release. I loved it. Love the story with Rory and Sadie. So far now plans for the weekend except forecast reports is snow. I hope they are wrong you know how I feel about the white stuff. I need to finish wrapping/bagging a few gifts that I didn’t have the right bag for when I was doing it earlier in the week and my sister gave me the bags since she had so many. Other than that my plans are to do some reading. Hope you have a great Tule ugly sweater today sounds like fun. The scones sound yummy. My Great-niece in town for a swim meet and I am going to be spending the weekend at the pool. I have not had a chance to see her compete in a few years, so I am thrilled to be in her cheering section this weekend and to spend time with her mom, dad and little sister. Made my week when I found out they were coming. Congratulations on the new book. I’m 85% finished. Loving it so much. Youngest has basketball tomorrow morning, we have Scott’s company party tomorrow night, and Johnny has a church youth Christmas party on Sunday. Congrats on your new release! I’ve always enjoyed your books! I’ll be adding it to my “to read” list on Goodreads. This weekend I’ll be wrapping the kids presents!! Still recuperating from bronchitis. So am spending the weekend at home reading good books. I’m having a few friends over to celebrate a birthday. There’s lots to do and we’ll each help out. It should be lots of fun with good food, discussions, and just enjoying each other’s company. BTY – that scone recipe looks great – it will be used for Christmas morning. No major plans for the weekend. Baking, reading, some cleaning, and not sure what else. The recipe looks good. I LOVED Rory and Sadie’s story. Jane you are amazing and so talented!! I have a concert to attend and want to get my cards done. This weekend is my (self-imposed) deadline to mail the presents for the family members who live out of town. I always have a big Tupperware container of frozen ch-chip cookie dough that I have made in advance just in case 1)I have a minute to bake, or 2) need a gift as I run out the door. Yes, I give frozen dough in little buckets. Sunday is cookie baking day with my friend Carla. We started the tradition last year. We are going to the TSO concert! 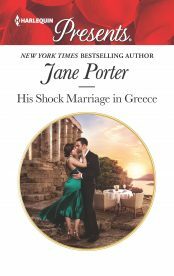 Happy Release Day, Jane. I’ll be home this weekend searching for deals for presents. Congratulations on your new book! This weekend, I’m doing some shopping, not just for gifts, but for some items to hang on the walls of our house. We’re long overdue for some new decor, in anticipation of family coming in for the holidays. Looking forward to this book … and trying these scones! 🙂 This weekend I’m going to be watch some holiday movies with the hubby, maybe do a little Christmas shopping, and work on getting ready for the holidays. Merry Christmas! Happy Release Day! Finished the story in the wee hours, when I could not sleep. LOVED it! I am definitely going to re read it! I know that it gave you fits to write it, but it is amazing! The scones sound delicious. I wish I could bake. I have a holiday party tomorrow morning and will spend time my parents this weekend as well. Congratulations on your latest book, and thanks for what looks like a delicious scone recipe! I’m Canadian and probably not eligible for the giveaway, but I’ll share my weekend plans anyway: I’m travelling in Portugal right now and I’m going to go to the beach. So much nicer than the weather at home! We have snow here in South Carolina, so enjoying the beauty of a snowfall and maybe building a snowman if there is enough with my children. Thanks!!! Hubs wants to take honey roasted pecans to a Christmas party we’re going to & I’ve never made them before, so I’m going to do a test batch this weekend. Planning on writing Christmas cards & maybe wrap a few presents. Congratulations on your release day! Great prize pack! Merry Christmas! Congrats on the new book Jane!! My plans include putting my tree up. I stumbled across a couple of Holiday Favorites playlists for Faith Hill & Tim McGraw on spotify, so I’m listening to those getting in the mood. I may start tonight Funny enough, the Bing Crosby song I heard while at the book party at your house is now playing. Such a great time with new friends! ❤️ Happy holidays to you and your family! Much love!! My oldest son’s Christmas party in Saturday then baking, wrapping and church in Sunday! My oldest son’s Christmas party on Saturday then baking, wrapping and church on Sunday! 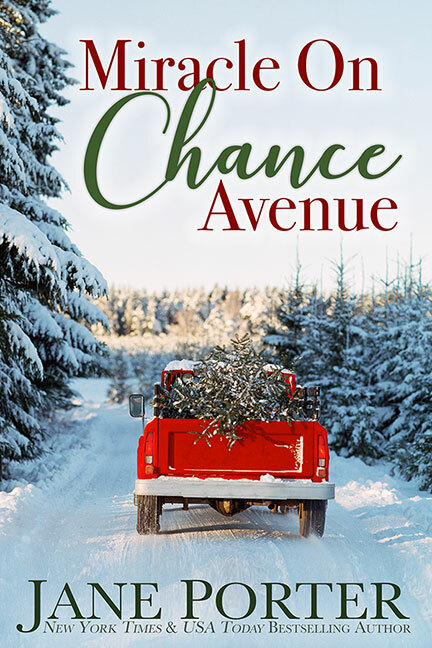 Congratulations on the release of MIRACLE ON CHANCE AVENUE. I read the blurb on Amazon and it sounds enjoyable. 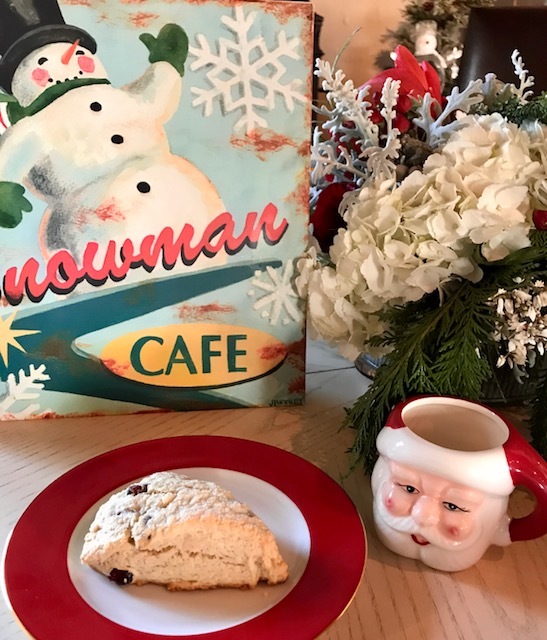 The scone recipe sounds delicious and will be part of our Christmas brunch. This weekend’s plans may change. We got some unexpected snow today and I’m not sure of the impact yet. From 8:30 to 4 on Saturday I have a conference on Children’s Mental Health. We will go to church afterwards. We are Red Cross disaster volunteers and with this unexpected cold weather moving in we could get fire calls tonight and through the weekend. I certainly hope not. It breaks my heart when people lose everything and it is worse during the holidays. Sunday there is nothing scheduled so it will be a day to spend on cleaning and straightening up so we can put up our tree. We have so many volunteer commitments I am never home. By the end of next week we should be finished with everything we need to do except for fire calls. I’m going to have to read this book. It sounds great. My plans for this weekend are to read and rest. We are delivering all the toys I’ve bought for Toys For Tots to a TV station in town then I can finally get the family room ready for Christmas. congrats to you Jane! plans are to relax a bit, do a bit of reading, do a bit of shopping, and laugh as much as i can. happy weekend to you! Wednesday it was 70 degrees- today it is snowing! So I will be playing with y dog friends in the snow…I live in Atlanta….. This weekend I am going to finish up a couple of Christmas presents I have been crocheting & then spend some time figuring out what cookies I need to make. Cleaning. My mom comes next Thursday for a week so I need to get her room ready. I need to get all my presents ready to mail next week. I think u need a mug that says, Marietta Forever! My husband and I are going to a Christmas party with a potential new company for him as CFO. I will be out buying a fancy dress while he plays with his new four-wheeler. I plan on going Christmas shopping this weekend. Baking too it looks like. Since the weather is good we plan to take a walk to BelSquare and do a little shopping (walking means no hassles with the parking garage) then we are going to decorate the tree and have dinner at home and the go to a Holiday concert.We will Skype with our son Sunday morning and in the afternoon some Christmas cookie baking, more decorating and listening to carols. Busy times but have your new book on my Kindle so will steal some time to read it, too!). Congrats on the new release Jane. I plan on putting up my tree, baking and wrapping up my gift buying. 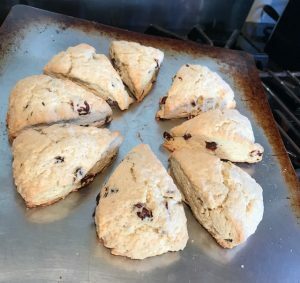 I love scones and will be trying this recipe. Thanks for the recipe. Happy Holidays. I’m located in the north part of Atlanta and we got snowed in this weekend. About 7-8 inches here. The most I’ve ever seen in this area since I’ve lived here. It’s a good time to make your scones and read one of your great books! I’ll be spending lots of time on the couch in front of the fireplace and reading this weekend. Might do some baking too. I love the cover. Light snow in VA…will wrap gifts this weekend. Thank you for the great looking recipe, will definitely try it. I always ran a cafeteria too with three boys and a husband…looks good on the resume. Congrats on the release! 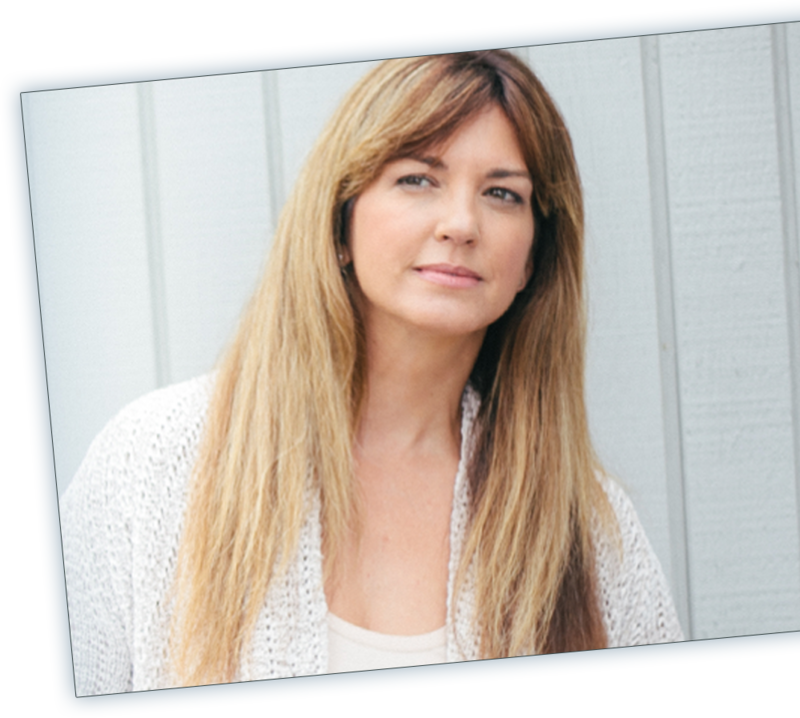 Don’t know how you do it all — Miracle Worker? Congrats on the new book and our plans are after hubby gets his hair cut he is going to stores with my list and doing the shopping. I will be by the phone as I am severely disabled and not able to go shopping if he has any questions at all so far 13 calls. Then tomorrow we go to church and then coming home to pick up our 2 pups and we are having out Christmas pic taken. Then it’s time to go back home and that is our plans. Gotta go the phone is ringing again! I can’t wait to read your new book! I am staying home this weekend and finish my Christmas shopping online. Today I’m resting & catching up on email. I’ve spent the last 3 days helping my ex-sister-in-law. She had a knee replacement in November, but fell a week ago – yesterday she had a 2nd surgery which showed the needed repairs from the fall – so it was a full day of sitting in different spots around the hospital – got home about midnight. Lesson: take care of you joints! Tomorrow I have to get back into Christmas. Talked with my sister, who just found out she has a malignant node after her lumpectomy … visited my bro-in-law in hospital awaiting triple bypass tomorrow after his recent heart attack … visiting my badminton partner in hospital after his brain tumor was removed (and hasn’t heard yet if biopsy showed benign or not) … worked 6 hours straight printing my Christmas newsletter poem, sticking copies inside Christmas cards, writing personal comments (and then mailed/dropped them off the following day) … Christmas shopped … visited neighbors … and hopefully I can squeeze in some grocery shopping today too. Going to fly to Southern CA with my adult daughter for a Mother/Daughter luncheon my SIL has every year and this is our first time going. Cousins and friends will be there. Mothers are all older [60s-70s] so are daughters and granddaughters. We are excited! Congratulations on your new release. I love your Christmas books.I wound up staying home this weekend. It was so frigid cold and wet I stayed inside put up Christmas decorations and binge watched season 2 of The Crown. I did some word find puzzles for my brain exercises.Pulled out my Pride and Prejudiced Adult coloring book and colored for relaxation 🙂 My husband had been called into work on Saturday so I was alone with my dogs. I then spent that evening reading a Christmas book on my Kindle. Rest and relax this weekend! Spent a weekend over in Cayucos and then a week with my niece while her folks were celebrating their 30th wedding anniversary in Tahoe. I was ready for my bed! But I did have dinner with my mom on Sunday night at Red Lobster in Visalia. And we faced the crowds at Walmart afterward! LOL All in all a great weekend. Thank you so much for your good wishes, great energy, and social media shout outs! I’m so grateful for the reviews and the emails you’ve sent me to share your thoughts. My heart is thankful and full of love for all of you! The winner for the giveaway for Miracle on Chance Avenue is #15 Donna Panzardo! Look for the prize in the mail soon, Donna and thank you, everyone for your wonderful support of my book. Yeah, Thank you Jane. I’m sure you have my address but if you don’t let me know and I’ll send it again. And I still haven’t wrapped/bagged those few christmas gifts. I keep putting it off. But when I get home today I’m going to get it taken care of. Great story to get me in the Holidays spirit and will make a great book to give as a gift. Will be trying the recipes and thx for the chance! !